DALLAS — Research from Parks Associates finds that 43% of U.S. broadband households that own or plan to purchase a smart TV or streaming media player consider voice control to be an important feature for their next purchase. Parks Associates industry report The Impact of AI on Consumer Entertainment examines the impact of AI on the entertainment industry and the future role of AI in user experience, service delivery, content creation, and monetization of video services. The research report also addresses the impact of AI on data, as AI requires monitoring large quantities of personal data and creates concerns for consumers about security and privacy. In early 2018, the average broadband home hosted 10.4 connected devices, of which 8.6 are connected CE devices. 55% of U.S. broadband households find voice control of connected entertainment devices appealing. 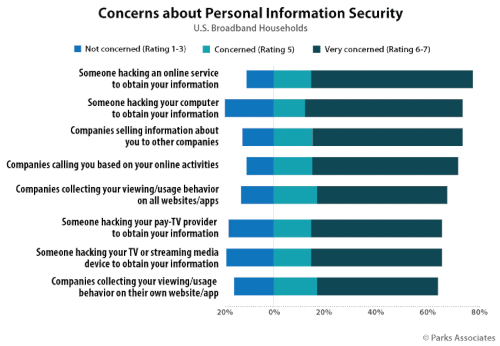 49% of U.S. broadband households find that a website/app that allows you to delete collected data would increase their confidence in use of an online service.